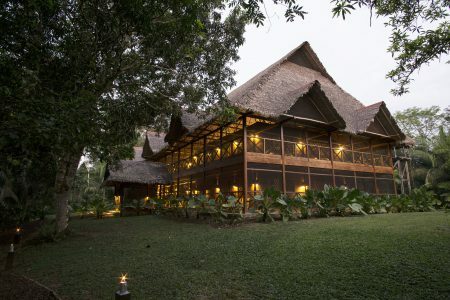 Deep within the heart of the Amazon – where the story of Inkaterra first began – lays Inkaterra Hacienda Concepción, located between the Tambopata National Reserve and the shores of the Madre de Dios River. 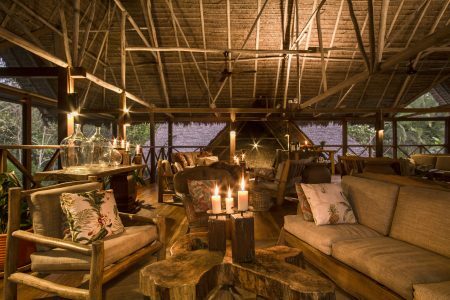 Nineteen private cabanas sitting majestically on stilts and a six-room casa grande with high ceilings and a rustic thatched roof are peppered around the property. 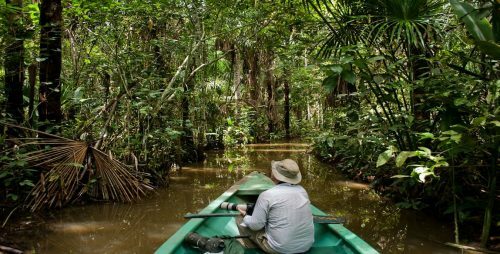 An astonishing selection of activities is led by local explorer guides, offering first-hand knowledge of the Peruvian Amazon. 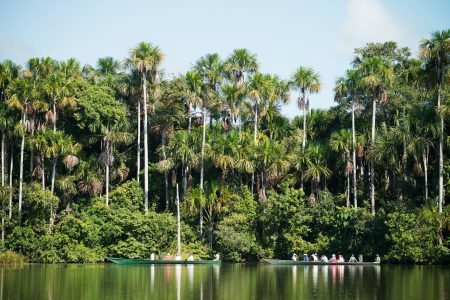 Excursions include a visit to Lake Sandoval, a water mirror inhabited by Howler monkeys, caimans and giant river otters. You can choose all inclusive programs ranging from 2 to 4 nights, but we suggest a minimum of 3 nights to guarantee an unforgettable experience. Day 1 Arrival – Concepcion Trails & Twilight River Excursions. Day 2 Lake Sandoval, Canopy & Anakonda walks and Rainforest by night. Day 3 Canoe and cultural excursion. Day 4 Butterfly house – End of the program at Puerto Maldonado airport. Start your journey arriving to Puerto Maldonado, where our staff will welcome you and provide the necessary information for your stay. Navigate by outboard motorized canoe along the Madre de Dios River to Inkaterra Hacienda Concepcion for approximately 25 minutes. Enjoy LUNCH with organic ingredients and native flavors. After lunch, take a walk through CONCEPCION TRAILS, our inside property nature trails, where you will discover and learn about primary and secondary rainforest, its components, uses, transformations by the human being, and its relevance for the world. At dusk navigate by outboard motorized canoe, at the TWILIGHT RIVER excursion. By sailing on the Madre de Dios River, you will learn about its ecosystem, Amazonian creeks, nocturnal animals’ behavior, and the southern constellations. In the evening enjoy a nice DINNER in the Casa Grande’s dining room. Back to the lodge for LUNCH, and later the INKATERRA CANOPY WALKWAY & ANACONDA WALK await for you. Take a 20-minute ride by outboard motorized canoe to the Inkaterra Canopy Walkway Interpretation Center where you will learn about its construction and the conservation projects of ITA-Inkaterra Asociación (NGO). Ascend one of the two 98-foot towers (30 m.) and cross the 7 hanging bridges that connect the treetops at 91 ft. high (28 m.). Enjoy the breathtaking vistas and get the chance to watch white-throated toucans (Ramphastos tucanus), woodpeckers, trogons, squirrel monkeys (Saimiri boliviensis) and the three-toed sloth (Choleopus hoffmani). 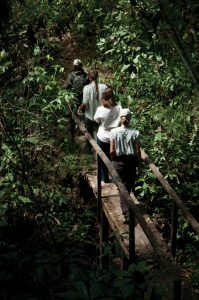 After descending keep on feeling the incredible primary rainforest energy going along the 200-meter wooden bridge over the swamps (aguajales). You will learn about the fauna and flora of this flooded ecosystem. At night get ready for an adventure at the RAINFOREST BY NIGHT excursion, where you will explore the Amazon rainforest that gives way to nocturnal animals who display intriguing behavior patterns, and enhanced senses as adaptation mechanisms. Listen to nocturnal living nature sounds, and penetrate this hidden world. Return to the lodge and enjoy a nice DINNER. Getting back to Inkaterra Hacienda Concepcion you will have LUNCH. Take a rest and get ready for the COCHA water excursion. 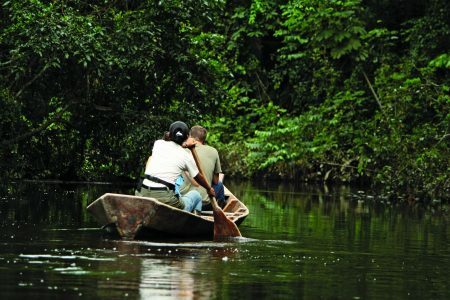 Enjoy a dugout canoe ride on the Inkaterra Hacienda Concepcion natural pond (cocha). Try native fishing applying the “catch and release” techniques, as you enjoy the scenery observing hoatzins (Opisthocomus hoazin), a diversity of fly catchers, and gray-necked woodrails (Aramides cajanea). you will see different species and their night routines by observing through our “blinds”. End up your day with a pleasant DINNER. After BREAKFAST buffet, take a ride back to Puerto Maldonado by outboard motorized canoe. 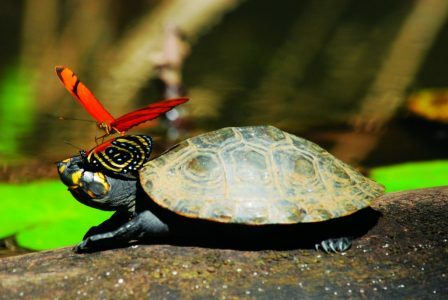 Arrive at the Butterfly House where you may wait for your flight back home or to your next destination, while visiting this beautiful BUTTERFLY HOUSE and learning about the fascinating transformation of these colorful insects. Note: Check-out time is at 11:00, you could choose to stay at the lodge or go earlier to Puerto Maldonado. Although lunch is not included on the last day, you can choose to have lunch at the lodge (pay directly at the hotel) or have a snack at the Butterfly House (additional cost). For further assistance, please contact our Reception team. 4 nights accommodation in Inkaterra Hacienda Concepcion. Tips to the drivers, guides & porters.